Margot Wallström: feminist foreign policy. Wikimedia / Frankie Fouganthin. Creative Commons.Earlier this month, Sweden’s social-democratic prime minister, Stefan Löfven, announced that the country would not be renewing its military co-operation agreement with Saudi Arabia. The English-speaking media were full of praise. Here was the feminist foreign policy which Margot Wallström, the foreign minister, had promised. “It’s always nice to have the Scandinavians around, to show us there’s a better way of doing things,” said the Guardian. There were calls for other western governments to follow suit, leavened with scepticism that more ‘pragmatic’ administrations would ever exhibit Scandinavian levels of idealism. Was Stockholm, perhaps, a little naïve? Foreign Policy summed it up as “money versus principles”. The Guardian called it “a clash between Sweden’s progressive foreign policy and the harsh realities of the Middle East”. The truth is that Sweden’s ‘progressive’ foreign policy is a decades-long study in äta kakan och ha den kvar—having your cake and eating it. The self-described ‘humanitarian superpower’ is, per capita, simultaneously the EU’s most generous humanitarian-aid donor and its biggest arms exporter. Domestic law prohibits export of weapons to countries guilty of “widespread or grievous” human-rights violations. This has not appeared hitherto to include such major customers as Thailand, India, Pakistan and Saudi Arabia. A committee appointed by the Riksdag in 2011 to address the tightening of arms-export rules has yet to report. Sweden was a strong supporter of the UN Arms Trade Treaty, which came into force last December. But when asked what impact the treaty was expected to have on its own exports, the immediate response from the Foreign Office was none whatsoever. Swedish ‘neutrality’ is not always what it seems either. While the then prime minister, Olof Palme, was acting as UN mediator in the Iran-Iraq war, the Swedish company Bofors was sending explosives and gunpowder to Iran—almost certainly with Palme’s knowledge—via the former German Democratic Republic. During the 2000s, successive Swedish administrations condemned the conduct of the American ‘war on terror’ while collaborating in secret with CIA intelligence-gathering and ‘extraordinary rendition’. And neutrality proved no obstacle to direct Swedish military participation in the first Gulf War or the 2011 NATO-led operations in Libya. Sweden has had strong commercial ties to Saudi Arabia since the 1970s. Swedish troops were deployed there under the UN banner during the Gulf War and in the early 2000s Swedish firms sold the kingdom large quantities of anti-tank weaponry for defence against Iraq. The controversial agreement goes back to 2005, when the Swedish government—then, as now, under social-democratic leadership—was lobbying hard to persuade the Saudis to buy the Ericsson-Saab ‘Eyrie’ airborne radar-surveillance system. A trade mission headed by Crown Princess Victoria was sent to secure the deal. (Like the British, the Swedes have learnt the value of royalty in dealing with Gulf states.) A sweetener was offered in the form of a ‘memorandum of understanding’, according to which FOI, the Swedish state-owned defence-research institute, would give the Saudis long-term assistance with the production and development of military technology. This was a tried-and-tested approach: a similar agreement had been made with Pakistan. Details of this ‘co-operation’ remained however confidential, until a series of newspaper investigations in 2012 exposed a secret plan, Project Simoom, for FOI to help build a weapons factory deep in the Saudi desert, working through front companies to avoid parliamentary oversight. When it emerged that government had lied about its knowledge of FOI’s actions and edited a sensitive meeting out of diaries, the defence secretary, Sten Tolgfors, resigned. The ‘Saudi affair’, as the Swedish press called it, was only the latest in a string of scandals. In 2011 Saab was forced to admit paying bribes in connection with the sale of jets to South Africa. In 2007 Swedish television had disclosed that Saab and its British partner BAE had also used bribes to sell JAS Gripen fighter aircraft to the Czech Republic, Hungary and South Africa. And an investigation in 2001 had revealed that the state-owned Swedish Space Corporation tried to sell surveillance systems to Muammar Qaddafi’s Libya. Undercover film showed a representative of the company explaining to the Libyan trade minister how “we can help you control the refugee situation along the borders and in the Mediterranean”. If anything, the Swedish experience is an object lesson in the difficulties of imposing democratic control on foreign policy. Thanks to the dedicated work of the peace-and-disarmament movement, and of the media in exposing the corruption which invariably accompanies the arms trade, the issue has at least achieved greater prominence in Sweden than in most other countries. Polls show that over three-quarters of the population oppose all arms sales to dictatorships. In 2013 the Social Democratic Party conference voted—against the leadership’s wishes—to introduce a ‘democracy criterion’ for all Swedish weapons exports. Only one party in parliament, the right-of-centre Moderates—which enjoyed an unprecedented two terms in government from 2006 to 2014—was in favour of maintaining the Saudi agreement. The Greens had been particularly forceful in opposition and, according to some reports, even threatened to leave the current coalition with the Social Democrats if the deal were not scrapped. The self-described ‘humanitarian superpower’ is, per capita, simultaneously the EU’s most generous humanitarian-aid donor and its biggest arms exporter. The business lobby had other ideas. As the deadline for renewing the Saudi agreement approached, 31 Swedish business leaders—including the heads of Electrolux, Saab, Volvo, Ericsson and H&M—signed a letter to the Dagens Nyheter newspaper, which appeared under the headline ‘Sweden’s trustworthiness as a trading partner is hanging in the balance’. Such pressure had worked before. The previous government had been close to backing out of the agreement eight years ago, partly due to concerns raised by the civil service that the weapons-factory plan might break the law. But it relented after the personal intervention of the chair of Saab, Marcus Wallenberg. If the deal were torn up, Wallenberg warned, the attitude in the Gulf would be “forget about the Swedes”. This time he did not get his way. 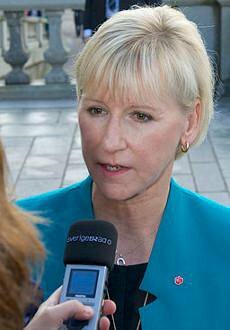 The Saudis’ insulting treatment of Wallström probably did not help. A day before the revoking of the arms agreement, they blocked her from giving a speech to the Arab League in Cairo on women’s rights and democracy, in which she had also planned to condemn the sentencing to 1,000 lashes of the Saudi blogger Raif Badawi (for the moment apparently suspended). The significance of the decision should not however be overstated. While the foreign media praised the bold and principled Swedish move, and the domestic press argued over the political fallout, Swedish campaigners were more cautious. “We must keep working to make sure that our joy today does not turn to disappointment tomorrow,” said Anna Ek, chair of the peace-and-disarmament campaign Svenska Freds. Ek warned that the termination of the military co-operation agreement did not automatically mean an end to weapon exports. And she pointed to recent leaks to Swedish Radio which indicate that the parliamentary committee on the arms trade will recommend that ‘reasons of defence and security policy’ should have priority over democratic and human-rights criteria. To say that “Stockholm tore up a long-term arms trade agreement with the Saudis which had brought in the equivalent of £900m in 2014 alone”, as the Guardian reported, is misleading. These sales are not directly tied to the military co-operation treaty, which in any event is something of a dead letter. By the time the government took its decision the only live initiative was an offer of ‘medical training and gender training’—which the Saudis had not taken up. In the last few days government ministers have been busy earnestly declaring their commitment to continued trade with Saudi Arabia and the other Gulf states and issuing apologetic ‘clarifications’ to their criticisms on human rights. This is not to talk down an important victory. The determination with which big business fought to preserve the agreement is testimony to its symbolic importance. But the true lesson of the Swedish experience is that the fight against the arms trade requires tremendous energy and vigilance, and that even the most ‘progressive’ governments are not to be trusted.